There is a little shed on a tiny sliver of land jutting into the lake. I am no metallurgist, so excuse me if I take it to be made of tin, or thakaram as it is called in Tamil. That paints a nicer picture for the romantic in me, you see. This shed is unlike any other, or so I tell myself. It is an amphitheatre where such drama unfolds, the likes of which even Bollywood could not have seen. So pardon me for calling dibs on a permanent seat on the floor. The tharai ticket, as we Tamilians like to call it, used to be the cheapest ticket at the local cinema, typically on the floor, right in front of the screen, and affording the spectators (usually children) the simple pleasure of squatting, and the supreme luxury of erupting in a raucous jig at the slightest excuse. Sadly, this disappeared with the advent of multiplexes, aerated drinks, and airconditioning, not necessarily in that order. Anyway, this little tin shed on the Powai Lake has played host to romances, tragedies, thrillers, mysteries, and everything in between, but with some serious twists. Firstly, the actors are not always human. And secondly, it is all spontaneous and impromptu, kind of like improvisational stand-up comedy – the blink-and-you-shall-miss kind of action that goes against the theatre norms of scripted films, re-runs, show-timings, and advertisements. The kind that one is unlikely to ever find on torrent sites and DC++. Lastly, it is always, always free (as in “free beer”). As you may have surmised by now, I am a happy resident of a campus by the lake. And it is not just any old campus, mind you. I live inside the Indian Institute of Technology (IIT) Bombay campus. And, consider myself privileged to stay here - a little haven within the bustling metropolis of Mumbai, a tiny island (metaphorically speaking) that is cut off from the city's concrete jungle, fumes, pollution, famed commutes, and crowds. It is nicely ensconced between the breathtaking (and crocodile infested) Powai lake on one side and a hillock worthy of picnics on the other. What is more, it shares borders with the Sanjay Gandhi National Park (SGNP) – borders and fences that the numerous wonderful residents of the park frequently disregard! There are even notices warning folks to not venture into certain areas that are prone to, say, a stray leopard that wandered in from its home adjoining the campus. During the rains, tracts transform into miniature rainforests, replete with leopards and langurs, pittas and pangolins, macaques and magpie robins. So in this case, the adage 'good fences make good neighbours' can be left to rust unburnished. For here, there is scope for osmosis, for the city's green lungs to breathe, for good neighbours to evolve and learn to co-exist. How much fun is a neighbour who does not visit, share, interact or borrow? How can a neighbour be good if there is no interaction? For good neighbours come into existence not when fences go up, but when walls crack, crumble and fall. Mumbai itself is a rather interesting city. It sits jutting into the Arabian Sea, which will explain the high humidity of the region, and thanks to the undulating terrain and heavy monsoons plays host to a respectable variety of fauna - avian, mammalian, reptilian, and invertebrate. One can find many hills worthy of treks, ranging from the easy to those that are considered precursors to Himalayan expeditions, many within an hour's drive from the city. During the monsoon, the suburbs don a green blanket, and waterfalls erupt out of any rock possible. The four hundred or so forts in the vicinity (right up to the Konkan coast in Goa), many built by Chhatrapati Shivaji, are good places to go on treks (and get a taste of history and folklore). The monsoon is considered a good time of the year to go trekking, especially since the rain is a refreshing drizzle when compared to the sultry humidity of the other significant portion of the year - summer. Adventure sports have also been gaining momentum in the area - and for the adventurous, waterfall rappelling during the monsoon should be a definite try. One does everything one does in the 'usual' rappelling, with the addition of going down a waterfall, frequently WHILE it is raining! The adrenaline rush of going down a 150 ft waterfall while it's pouring cats and dogs, and savoring the view from the middle, is heady! The combination of the sea coast with hills and forests ensures good resident and migrant populations of avifauna. 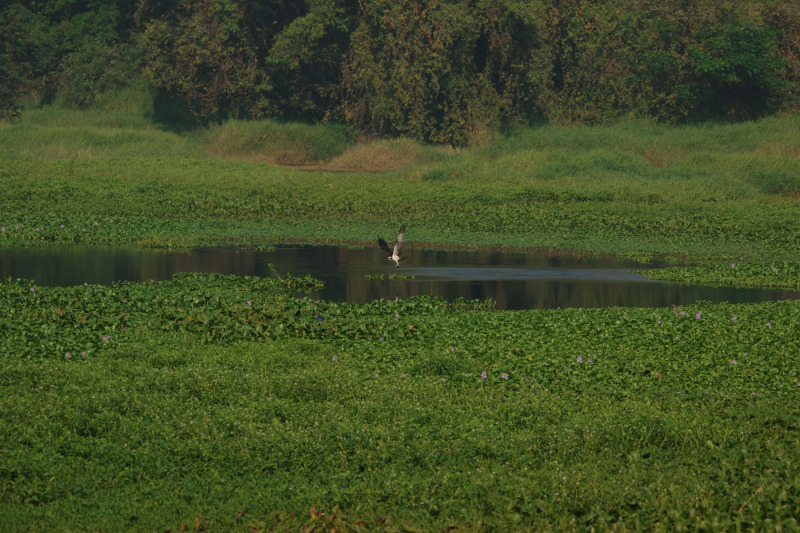 Water birds, waders, and forest dwellers can all be found in or near the city. Let us start at the beginning. My love affair with the Powai lake started about six years ago, during my first ever Mumbai monsoon. With tangled vines and tall trees in varying shades of green, drip stains on buildings great and small, resonating bird calls, and many a fall on the slippery stones of the Infinite Corridor, I was welcomed into the IIT Bombay fold. Is there anything like some rain to bring out the colors of the forest? That monsoon on campus was sheer magic, as I settled in to explore what I could of the institute. The first stop of the campus’ tourist circuit was the lake, of course. There was a sign warning folks against proceeding beyond the gate running between Jal Vihar (the lakefront guest house) and the Powai Lake after dark. Here be marauding leopards, consider thyself forewarned. Or something similar. Which of course meant that I absolutely had to see what was beyond those gates. I played it by the rules (don’t judge me, I was still a campus noob, remember? ), and one Saturday morning when sunshine had won the peek-a-boo with the clouds and there was a brief respite from the downpour, wound my way through the lovely trail that culminated in the cutest little shed. Over the years, I was to return and re-discover the shed, time and time again. The shed has seen many of my moods and phases, laughter, tears and tantrums, walks and talks. There was the brief jogging phase, which did not last very long considering the commute between the hillside and the lakeside. Then, there was the birdwatching phase when I would walk the lakeside stretch, pretty much end-to-end, but almost always starting in the middle, near Jal Vihar. The purple swamphens are likely to take the trophy for the most “First Bird of the Day” records. Giving them stiff competition for the title are the cattle egrets. The egrets may even be donning their breeding plumage, looking slightly silly in their dirty yellows, as opposed to the regular regal whites. Turn left and head towards the Temple cosily ensconced in one corner of the campus. Did you hear the shrill squawking of the rose-ringed parakeets? Whether flying overhead or feeding off a fruit tree, they are quite the party-goers. Thanks to their green good looks and their ability to mimic human speech, they are unfortunately popular as pets. What is it that makes people want to cage a bird, I could never understand! Moving on, one is likely to see a white-breasted kingfisher, perched on a slender branch, ready to nab a fish any minute now. There is no action movie in the world I would trade for the seat-of-the-pants thrill of watching a kingfisher fishing. No, seriously. Especially if it were the not-so-common and ineptly named common kingfisher. Some red-vented and red-whiskered bulbuls would be shuttling between the shrubbery, in total disregard of all and sundry. That dab of yellow squinting between the foliage might mean a golden oriole perched on a branch. Then, there’s the most dapper little bird of them all, the oriental magpie robin. Quite a name for a small bird, if a prim-and-properlooking one. Do not be fooled by his black-jacket looks – he can be supremely entertaining, changing his call every so often, mimicking anything that catches his fancy, trying to lure the lurking female, who in typical bird fashion is frankly quite drab in appearance. I would be desperately trying to identify the warbler in the bushes, when the booming, low coop-coop-coop of the greater coucal clashes with the metronomic beat of the coppersmith barbet. The former, easy to spot and looking like a glorified crow, while the latter, breathtakingly colorful if a tad harder to spot through the foliage. To me, the only bird seen on campus that can usurp the barbet, color for color, is the Indian pitta. This orchestra would be further amplified by the melodious cooing of the koel. 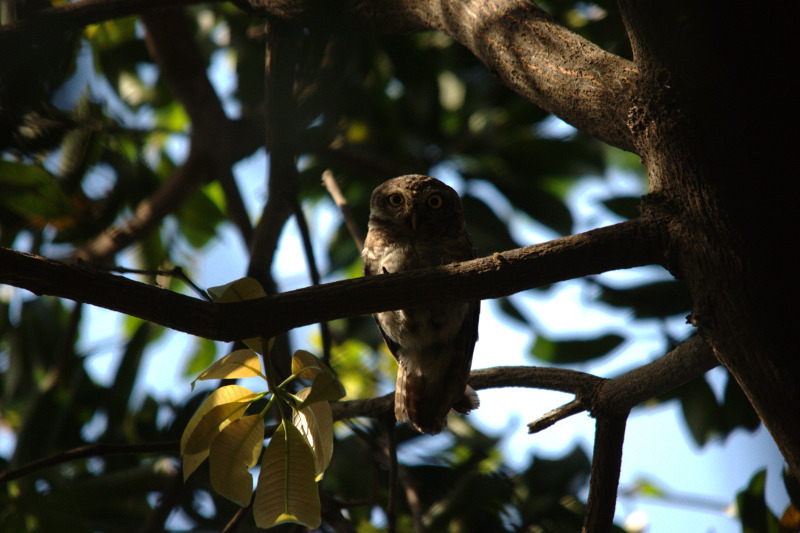 Suddenly, the forest would resound with the cacophony of the common hawk cuckoo, affectionately and aptly called the brainfever bird. This might possibly shock the other avian critters to a few moments of pregnant silence before the forest returns to normalcy. The super-shy white-breasted waterhen will likely sieze this opportunity to make a dart for safety among the reeds and weeds along the lake. On a lark, I would make a U-turn somewhere on this stretch, magnetically drawn towards the aforementioned tin shed on the other corner of my yellow brick road. This time, retracing my footsteps, I focus on the lake. This has rewarded me on numerous occasions with spectacular chases that would put the makers of the Fast and the Furious series to shame, ranging from an osprey swooping down to catch what looked like a massive catfish in its talons to a marsh harrier warding off a black kite from some spot in the hyacinths on the lake’s edge. 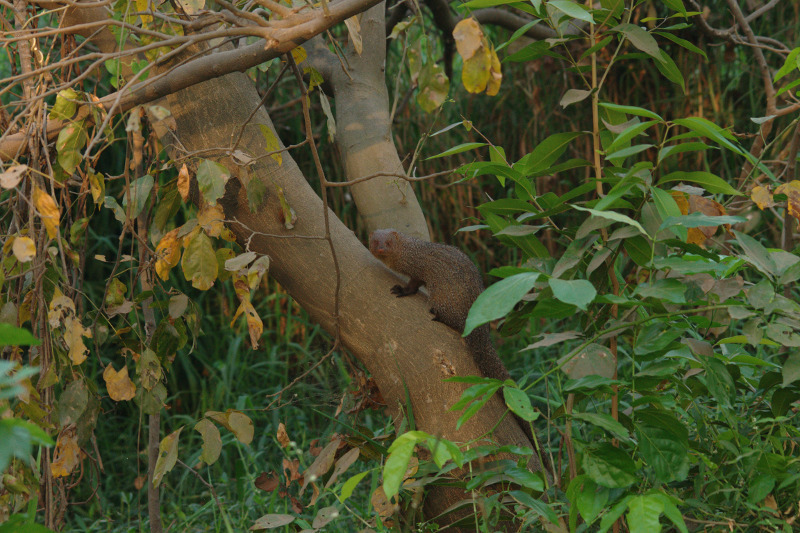 The birdwatching might briefly take the backburner when a mongoose crosses the road or a monitor lizard clambers up the palm tree or a common garden lizard basks in the sun, but not for long. Crossing Jal Vihar, one can watch swallows on the palm trees, cormorants spreading their wings in the sun for thermoregulation, spot-billed ducks and lesser whistling ducks paddling hither-thither, pond herons sitting boringly still, ibises wading between the hyacinths, and jaçanas both bronze-winged and pheasant-tailed gliding like ballerinas between the leaves floating on the water. I amble across the sunbird patch ignoring the noisy babblers flitting about and stop at the flycatcher patch which today decided to reward me with a magnificent male Asian paradise flycatcher, breeding plumage and all. Watching it to my heart’s content, I trudge on before stopping at the intersection that leads to the little tin shed. In the past, this area has pleased me with Indian grey hornbills and spotted owlets and orange-headed thrushes and flameback woodpeckers. Nothing today and so I continue, finally reaching the shed. Thankfully there is no one else around and I can watch the terns flying about in peace. My favorite time to be at the shed would have to be dusk but unfortunately that is when it is most crowded. During the day, on some days, one might see the occasional couple canoodling at a private rendezvous, or a fisherman about his work paddling in the water with a tyre for a flotation device. But come evening and the place is swarming with twos and threes and droves of people, swatting mosquitoes and scratching insect bites. However, some of my favorite birdwatching sessions have happened despite the crowds. Like a few years ago when I watched a pair of greater painted snipes go about their business, day in and day out for a month, on a tiny island just off the shed. And the number of times I have seen a red-wattled lapwing go berserk on another little island, weirdly drawing more attention to her tiny chick, rather than away from it! And the rare occasions when I saw mugger crocodiles lurking quietly in the murky water, just their snouts visible. The mention of crocodiles reminds me of an anecdote from a dinner with friends a few years ago. The legend goes that many, many years ago, a young student (who is now a faculty member here and shall hence not be named) would religiously swim across one of the triumvirate of lakes (namely, Powai, Tulsi, and Vihar) in the vicinity of the campus. One fine day, while swimming towards the target island, the person saw what was assumed to be a rock on the island move, only to realise that it was a crocodile! I wish I could say that the swimming ritual came to a standstill and the person shifted to the less exciting option of using the Gymkhana pool, but apparently students continued to swim even after this incident for a few years. These days the only brave souls who venture into the lake are the fishermen who appear at odd times, bobbing about with just their head above the water, and using a tyre to keep afloat, whilst trying to fish, possible remnants of a not-so-successful fish culture project started and abandoned decades ago. Reading reports of fishermen getting mauled by crocs in the lake, on and off, I find it sad to think about them risking their lives on the job. PS - I've used the true blue Tamil (or should I say Thamizh?) way of spelling words. Just FYI for those who are familiar with Devanagari script-based languages: 'thara' = 'tara', 'thakara' = 'takara'! For those who don't understand what I'm talking about, I have three words for you: ignorance is bliss. Contents © 2019 Kadambari Devarajan - Powered by Nikola. All photographs by Kadambari Devarajan are licensed under .